The Liberty Flames saw their three-game winning streak come to end, falling to the Duke Blue Devils, 6-1,Tuesday evening at Durham Bulls Athletic Park. The Flames jumped out to a 1-0 advantage, but the Blue Devils scored four times in the sixth to take a lead they never relinquished in the non-conference contest. Liberty falls to 16-11 on the season. Duke moves to 12-13 on the year. The Flames and the Blue Devils have now split their two meetings on the season. Liberty previously defeated Duke, 1-0, at Pelicans Park in the Baseball at the Beach tournament in Myrtle Beach, S.C., Feb. 27. The two teams will meet again on April 19 at Liberty Baseball Stadium. Held hitless through the first four innings, Liberty struck for the contest’s first run in the top of the fifth. Designated hitter Austin Bream led off the inning with a walk. Third baseman Eric Grabowski followed by lining a triple, the Flames’ first hit of the game, into the left center field gap, scoring Bream for a 1-0 edge. After starting pitcher Jack DeGroat kept the Blue Devils scoreless through the first five innings, the home team plated four in the sixth. Catcher Chris Proctor reached on an infield single and moved to second on a sacrifice bunt to open the inning. Third baseman Jack Labosky followed with a run-scoring double, knotting the game at 1-1. Later in the inning, the Blue Devils loaded the bases with two out and took the lead on a wild pitch by Flames reliever Shane Quarterly. First baseman Justin Bellinger then singled to plate two more runs to give Duke a 4-1 advantage. The Blue Devils added to its lead with single runs in the seventh and eighth innings. In each inning, leadoff doubles ended up scoring on a sacrifice fly, extending the Duke advantage to what proved to be the final score of 6-1. DeGroat, who was locked in a pitcher’s duel with the Blue Devils’ staff through the first five innings, falls to 1-1 on the year. The right-hander allowed three runs on six hits over 5 1/3-plus innings. He struck out three batters and walked two. Ryan Day, the fourth of six Blue Devil pitchers in the contest, moves to 1-0. He allowed one hit during two innings of relief. He struck out one and walked one. 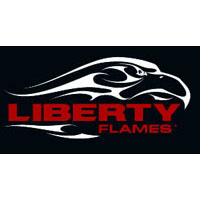 Liberty was held to two hits in the contest. Duke collected 12. Neither team committed an error in the game. The Flames step back into Big South Conference play, this weekend. Liberty will travel to Rock Hill, S.C., for a three-game series against the Winthrop Eagles. The series is scheduled to get under way, Friday at 6 p.m.